I moved up to Seattle from California in the fall of 2014 and immediately realized how special of a place the Pacific Northwest is. There is unparalleled access to a stunning variety of beautiful landscapes. Within a four-hour drive, there are multiple mountain ranges, waterfalls, rainforests, deserts and, of course, a handful of mind-boggling volcanoes that dominate their surroundings. 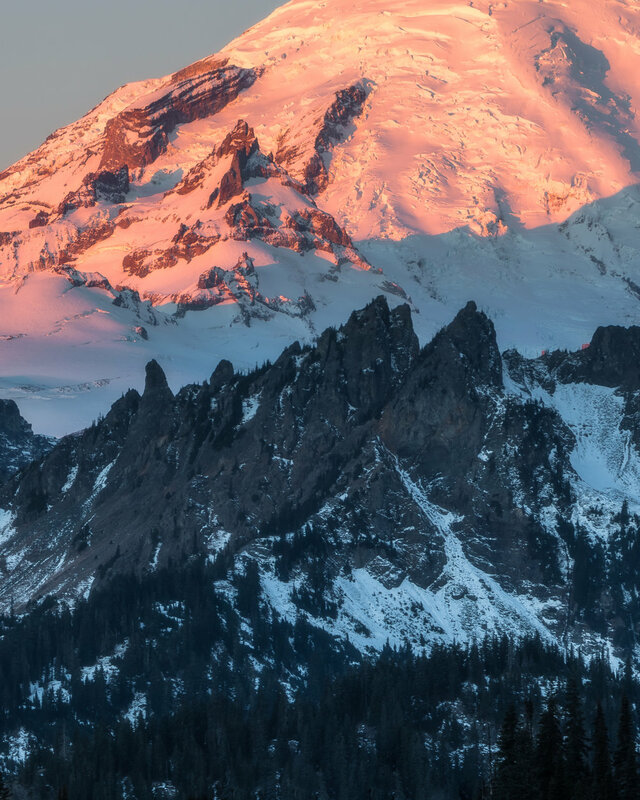 The summer after the move, I made my first trip out to Mount Rainier National Park and was instantly addicted to the breathtaking feeling of looking up at the peak. I’ve seen some beautiful areas including Yosemite, the Swiss Alps, Lake Tahoe and the Rockies; but no place takes my breath away more than Mount Rainier. Just in the past year, I’ve made four visits to the National Park, with my most recent trip being to Tipsoo Lake in mid-November. Tipsoo Lake has long been on my list of places to visit and photograph. Right at the top of Chinook Pass, this location offers stunning panoramic views of Rainier. And in the right conditions it provides a perfect reflection of the massive volcano. I had made one sunrise attempt earlier this year at the beginning of fall. But unfortunately when I arrived after the two-hour drive, the entire area was under a thick blanket of fog — I couldn’t see more than 20 feet in front of me. I left Tipsoo that morning with a couple of nice moody forest shots. But ultimately I was unsatisfied and knew I had to try again before the road closed for the winter. On Nov. 16 (a Friday), I got an email from the state Department of Transportation advising that the road over Chinook Pass would be closing for the winter on Nov 20. That weekend would be my last opportunity to see the lake, so I checked the weather forecast and was delighted to find that the forecast called for cold and crisp weather with no clouds and no fog. I woke up at 4 a.m. on Saturday morning and arrived at Tipsoo shortly before dawn. Unfortunately, the lake was 95 percent frozen over, so I had no chance for a reflection shot. Instead, I hiked up to a nearby vantage point and set up my tripod for panoramic shots. As the sun began to rise, the mountain lit up with that beautiful cotton-candy pink alpenglow that made all of the effort 100 percent worth it. When I'm out shooting photos in nature, all of the day-to-day worries disappear — I’m living fully in that moment. These coveted moments in a beautiful place like Mount Rainier National Park help me appreciate how minor my day-to-day worries and problems are in the grand scheme of things. This beautiful landscape has been shaped over millions of years, and it will be here long after I'm gone. It puts things in perspective knowing that the majority of things I worry about daily won’t matter in a week, a month or maybe even a year. Ultimately, landscape photography is a pursuit that gets me out into nature and helps to keep me grounded. Jake Gosline is a full-time commercial insurance broker and avid landscape photographer who spends most of his free time photographing and exploring the beautiful Pacific Northwest. You can follow his adventures on Instagram or on his website.